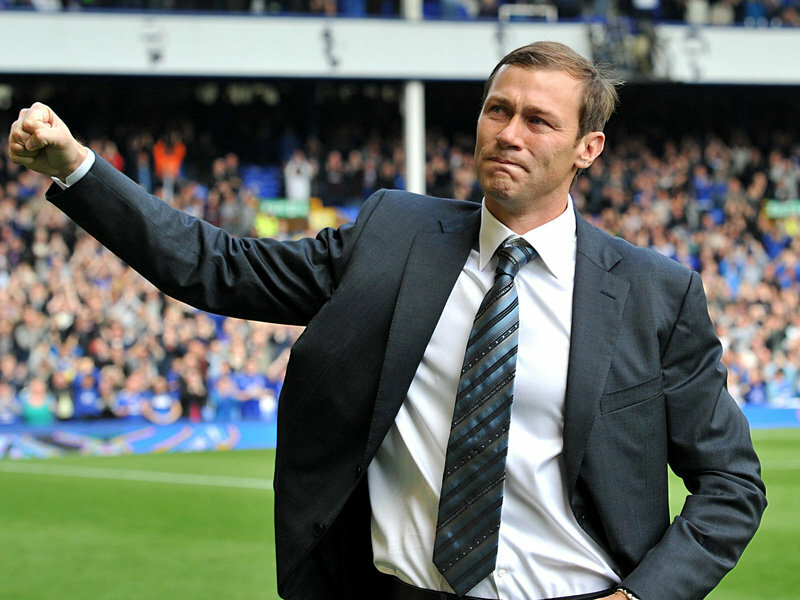 Duncan Ferguson – Cult Hero or Legend? For Evertonians of a certain generation, Duncan Ferguson was a shining light, in an otherwise dark era of Everton Football Club. Arriving at the club, with the Blues at a low ebb, Ferguson became an instant hero with his swashbuckling displays and his love for the club. But in a period of history, when Everton won only one FA Cup, could Duncan Ferguson be described as a legend, or is he simply a hero of the terraces? Ferguson first arrived at Everton in early October 1994, on a short-term loan move from Glasgow Rangers. Everton were struggling at the foot of the Premier League table and were without a win all season. The giant centre forward was due in court, charged with assault, following a headbutt on Raith Rovers player John McStay at the end of that month, and with a potential prison sentence on the horizon, it certainly didn’t look like a marriage made in heaven. However Ferguson had other ideas and in his 6th appearance for the Blues scored a towering header as Everton defeated Liverpool in the Merseyside derby. The then 22-year-old, was the toast of the Toffees and the club set about making his move south permanent. That deal was completed before the end of 1994, arriving with a £4m transfer fee. Further important, match winning goals were scored and by the time he was sentenced to three months in prison in 1995 the Evertonians had taken him to their hearts. Eternally grateful for the support the Blues had shown Ferguson during this difficult time, Duncan wanted to play out his entire career on Merseyside. However, in 1998, with Everton in financial strife, Ferguson was controversially sold to Newcastle United for £8m. He was back at Goodison within 2 years however, and marked his return with 2 goals against Charlton. The hero of the Gwladys Street had returned, but as throughout his career he was blighted by injury. Ferguson had all the ingredients to be a top centre forward. Strong in the air, but with a fantastic touch and a powerful left foot, Ferguson was blessed with the skills to be a world-class footballer. Much to his displeasure he was also fragile, both in mind and body. All too often, his head would explode and as his temper flared, the inevitable red card would follow. He was also beset with injury throughout his career and despite representing Everton for a total of 10 years, he only managed 273 appearances (191 starts), scoring a total of 72 goals. He often won games almost single-handed, with memorable matches against Manchester United, Liverpool and Newcastle living long in the memory. Ferguson often raised his game when the big teams were in town and when he made his final appearance for the Blues, against West Brom in 2006, he capped it with an equalizing goal in the closing minutes of the game. In a club with a rich history, Ferguson is described by many as a hero, a Goodison Giant undoubtedly, and with a new career underway in coaching, he could yet have a significant impact on Everton and justifiably earn the title of LEGEND.